Those who pledge $230 or more get a shot at a sixth figure; Ken! They are looking for a total of $550,000 to get the entire series made, or they will begin to seek private investors. The best part, is this is open to worldwide pledges now, where the previous one was limited to U.S. initially. Good luck to Capo Toys and we’ll be sure to update as the Kickstarter progresses. Check it out Here. The Street Fighter Ryu Kickstarter has ended. With pledges just over $8,000, the project, unfortunately, fell below the goal of $85,000. The first wave was to consist of Ryu, Sagat, Chun-Li, Blanka and Guile. The figures were meant to be in a 7″ scale, with Sagat coming in the largest at roughly 9″. With the Kickstarter funding for Ryu unsuccessful, what this means for the status of the line? I’m not sure. I am sure, however, that the crew at Capo Toys have something up their sleeve. I’ll be sure to keep you all up to date of any new info. 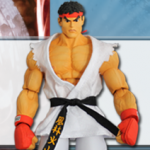 There’s less than 24 hours remaining for the Capo Toy Street Fighter Ryu Kickstarter. Right now, things aren’t looking too hot, but I’ve seen some stranger things happen. If you’re holding out on pledging, now’s the time to jump in. As of this writing, the pledges stand at just over $7,800. Best of luck to Rocco and the Capo Toys crew on the last day. We’ll update after the Kickstarter ends as well. If there are any major updates between now and then, I’ll try and post them up here. For now, you can check out the Kickstarter by Clicking Here. Also, don’t miss our previous photo gallery showcasing, what would be, the 7″ Scale Street Fighter Series 1 Figures. Here’s an update on the Capo Toys Street Fighter Ryu Kickstarter Campaign. There is just over a week to go. The pledges, as of now, are a little below $8,000 of the $85,000 needed to get the tooling made for the Ryu figure. 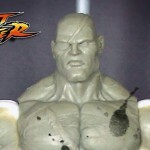 The figures are aimed to be in the 7″ scale, with the first series including Ryu, Sagat, Blanka and Guile. With only 8 days to go, time is running short to support the line. Sculptor Rocco Tartamella has sent along an update on the status of Capo Toys and the Street Fighter Ryu Kickstarter Campaign. After Toy Fair, a legal dispute arose between Rocco and the other members of Capo Toys, in which the partners claimed ownership over Rocco’s work. You can read up on the original dispute at Little Plastic Men. However, Rocco has officially come to a legal settlement with his ex-partners and is now the sole owner of Capo Toys and all of their properties. This is where the Kickstarter comes in. Capo Toys is in need of funding to get the line off the ground. They are looking for fans to help kick it off with the Ryu figure. They have also added a stretch goal that will fully fund the creation of Sagat as well. The Kickstarter has 16 days to go and is at $6,855 of the $85,000 needed to get this line going. Back at Toy Fair we got to report on some really fantastic looking Street Fighter Figures from Capo Toys. These will be roughly 7″ scaled figures and they were looking for them to be in the $20 – $25 range. They showed Ryu, Sagat, Blanka, Chun-Li and Guile. Now they have announced a Kickstarter Campaign to get this line going. They’ve sent along a press release, which you can see after the jump. With the Kickstarter, they are looking to fund their Ryu figure to start. Their rewards range from Ryu in his classic white gi, to alternate color outfits, artist proofs and even a statue in your likeness. It takes $35 to get one of the 7″ Ryu figures and the rewards go from there. Stretch goals include them going after the global Street Fighter license as well as included accessories. Capcom will be making an announcement on the line at San Diego Comic-Con. You can see it all at their Kickstarter Page. Capo Toys has tweeted out word that they are looking into producing some San Diego Comic-Con Exclusives for their upcoming, and fantastic looking, Street Fighter Figures. They are looking for fan feedback on what they would like to see. You can see the tweet and respond to @CapoToys and let them know what you want to see. Also, be sure to check out our photos of the Capo Toys Street Fighter Figures at Toy Fair 2014. Continuing our Toy Fair Redux series of posts, we have a nice clear set of images from Capo Toys Street Fighter line of 7(ish) inch figures. Somewhere in-between the SOTA releases and Play Arts Kai – these estimated 20-25 dollar figures balance sculpt, articulation, paint and price almost perfectly. Check out high res images of the figures from the show floor after the break! Check out these fantastic looking Street Fighter figures coming from Capo Toys. Their display at Toy Fair 2014 gives us a look at a few of their figures including Ryu, Sagat, Blanks, Chun-Li, and Guile. They will be 6″ to 9″ tall depending on the figure.